If you had asked us four years ago to name our top three family sedans, the name Ford would hardly have crossed our mind. Boy, have the times changed. The second-generation Ford Fusion strikes a chord that we normally wouldn’t associate with something as mundane as a mid-sized American sedan. 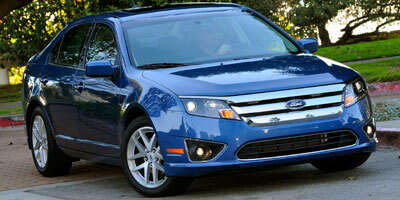 Compared to Ford’s first attempt in 2006 (and to many others in this class), this Fusion is a real looker. The low-slung front-end is subtly aggressive and wraps its way nicely around to the rear of the car, giving it a distinctive look. The interior begs similar praise, as soft-touch plastics and silver stitching accents create a more upscale look and feel. On top of styling, Ford has given consumers a number of drivetrain options. This particular trim, the SEL, is powered by a throaty 3.0-liter V-6 that provides plenty of gallop to accompany a connected, and dare we say fun, driving experience, sure to please perspective buyers. The smooth exterior look combines sharp lines with a distinguished front-end that separates the Fusion from some if its competitors. A surprisingly lively engine note and connected driving feel accompany the punchy 3.0-liter V-6. The rearview mirror that doubles as a backup camera screen is not only cool, but also takes the guesswork out of tight city parking. And of course, we can’t forget the voice-activated SYNC system. Climbing into the driver’s seat of the second-generation Fusion won’t take the air out of your lungs or ignite the hairs on the back of your neck, but then again it’s not supposed to. This car’s main mission is to take you from point A to point B, without drama, every single time. And it is here that the Fusion delivers just as well as its Japanese counterparts, which, in the past was a tough feat for any of Detroit’s Big Three. With that said, something about the charismatic engine murmur, smooth power delivery and unobtrusive manual shift mode puts it toward the top of its segment. The engine eagerly delivers power at a smooth, linear and predictable pace, with enough juice to make daily commutes a more entertaining exercise, should you wish to indulge. The capable chassis and suspension deliver a satisfyingly connected feel all while easily soaking up pockmarked city streets. Steering feel, while light, is more suited to cruising at highway speeds than sinuous back roads, but is plenty capable when you want to take the long way home. Unfortunately for the ham-footed among us, the touchy throttle will punish impatience with a less-than-welcome kick. The Fusion lineup defines choice, and ranges from an amazingly efficient hybrid to an athletic 3.5-liter V-6, meaning there is something for everyone. The SEL V-6 finds itself in the middle with a 3.0-liter V-6 producing 240 tire-chirping horses and 223 lb-ft of torque. Power is delivered to either the front wheels or all four through a six-speed automatic transmission – the only transmission choice for the SEL V-6. While this is by no means a sporty car, punching the throttle produces a surprisingly visceral amount of speed and sound. Our car came equipped with a healthy number of options, including the $895 Moon and Tune package, featuring – surprise – a moonroof and powerful 12-speaker Sony stereo. 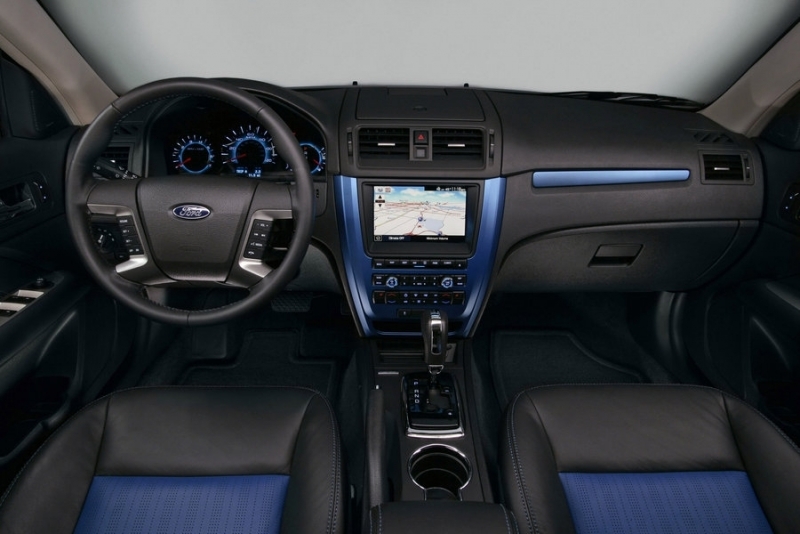 Also available is Ford’s industry-leading SYNC system, which uses voice-activation to do everything from change songs on your iPod to call contacts from your BlueTooth-connected phone. It even goes so far as to diagnose your car for mechanical faults. These features clutter the center stack though, making the controls for the radio and the dual-climate control system overly complicated. While an impressive amount of standard tech can be had in the base SEL Fusion, the real fun starts for a few grand more. The $1,795 Premium Package packs in backup sensors and a backup camera cleverly hidden within the rearview mirror. 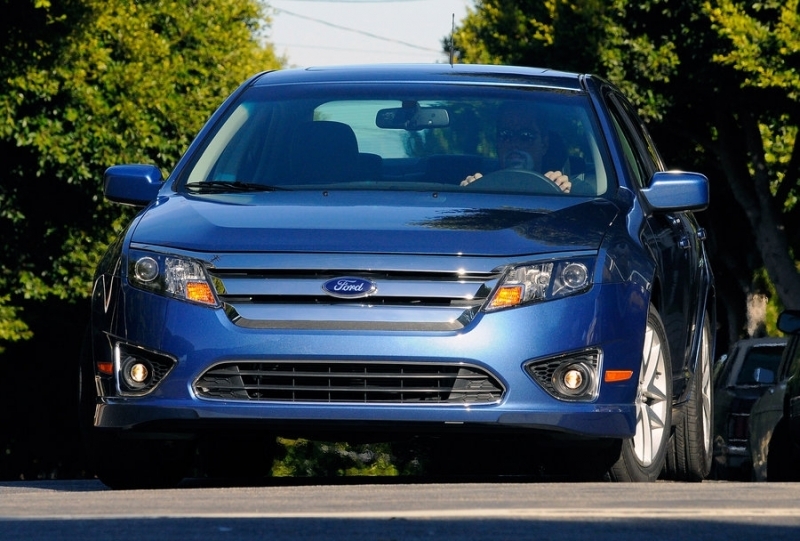 The Blind Spot Information System (BLIS) does do a good job of spotting small vehicles in the Fusion’s blind spots. If you’re concerned about your carbon footprint, the SEL V-6 is not the Fusion for you. The EPA estimates that a front-wheel drive 3.0-liter Fusion will maintain 18 miles per gallon in the city and 27 on the highway. 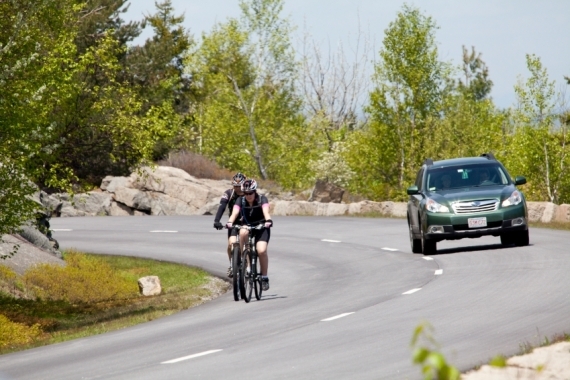 Throw on the all-wheel drive option and those numbers fall drop 2 mpg during highway driving. For those more environmentally conscious consumers, the more subdued four-cylinder engine or the hugely economical Fusion hybrid would be a better choice. The leather-wrapped steering wheel with its silver accent stitching is a nice touch, and the instrument gauges are elegant. While there are many more soft-touch interior panels than the last generation, we were disappointed by the somewhat loose fit. Taken as a whole, however, Ford has seriously stepped up its game. The exterior is where the Ford Fusion shines. Angular headlights stretch the look of the wide front-end while the understated bulge on the hood quickly draws the eye back over a well-composed body. Optional 18-inch wheels improve the car’s stance and fill the wheel wells nicely. 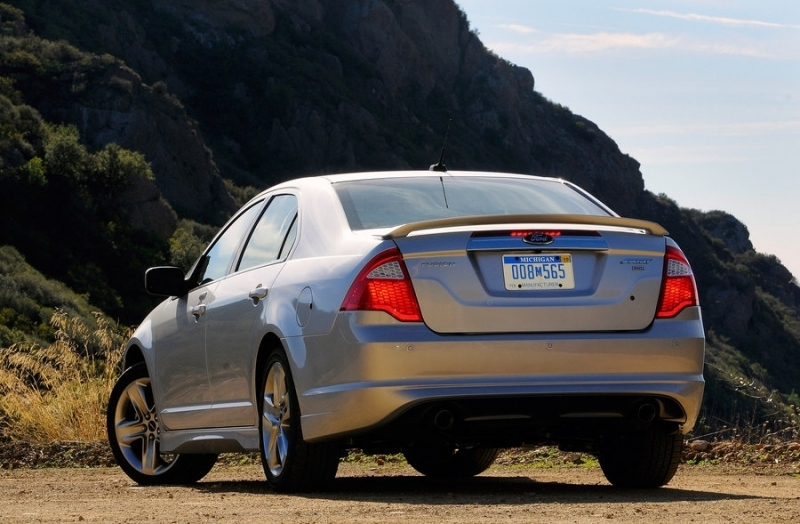 Ford has not only made sweeping exterior improvements over the 2006 Fusion, but they have also made it one of the better-looking cars in its class. Ford has covered a broad market with the Fusion that starts at $19,695 for the base four-cylinder Fusion S and jumps quickly to $27,950 for the Fusion hybrid, meaning no matter your lifestyle, you’ve got a Fusion to match. The Fusion SEL V-6 sits in the middle of the range, priced at a competitive $26,265, but expect the price to rise a bit with all the high-tech goodies on offer. Similar cars in the segment include the $25,995 Subaru Legacy 3.6R Premium, $26,805 Honda Accord EX V-6, $26,990 Toyota Camry SE V-6 and Chevrolet’s top-of-the-line Malibu LTZ at $26,955. If we have one single take-away, it’s that this car is extremely good. Despite small interior deficits and an anxious throttle – and we are clearly nitpicking here – the Fusion stacks up well compared to the competition. 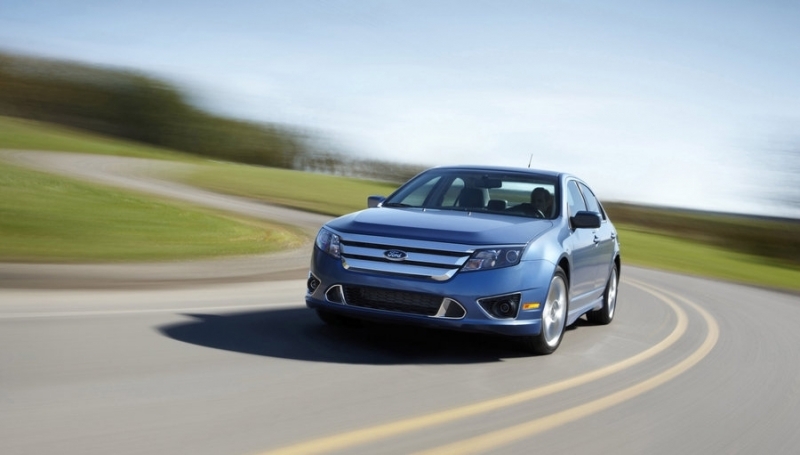 For the price, the Fusion delivers an impressive amount of tech and performance for the mid-size sedan segment. 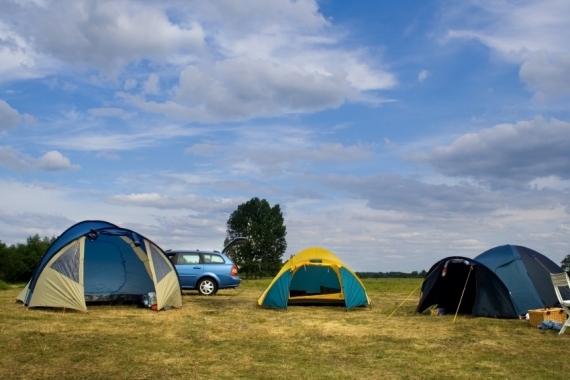 It does everything a car of its kind needs to do, plus a little more.